The lens is a living ocular tissue that, when healthy, is transparent. A normal lens helps focus light on the retina, a light sensitive nerve tissue located in the back of the eye. A cataract is an abnormality of the lens in which an opacity, or a cloudy change in the tissue, scatters light. Hence, the normal composition of the lens is disrupted and its transparency is lost. If a large portion of the lens becomes a cataract, it prevents formed light from reaching the retina, causing poor vision. A cataract can assume a variety of appearances such as small spots, a cracked-ice appearance, a diffuse milky haze, a “pearl-like” sheen, or white streaks. The cataract may initially affect a small area and progress to involve a larger portion of the lens. Rate of progression is difficult to predict, though it tends to be more rapid in younger animals. Most cataracts in dogs have a hereditary basis. Cataracts can also result from injury to or inflammation in the eye, or systemic diseases that have an affect on the eyes. Diabetes is the most common disease associated with cataracts in dogs. Although it may be difficult to name the specific cause of cataracts, generally those cataracts that develop in the eyes that are free of signs of disease (whether ocular or systemic) are assumed to be inherited. 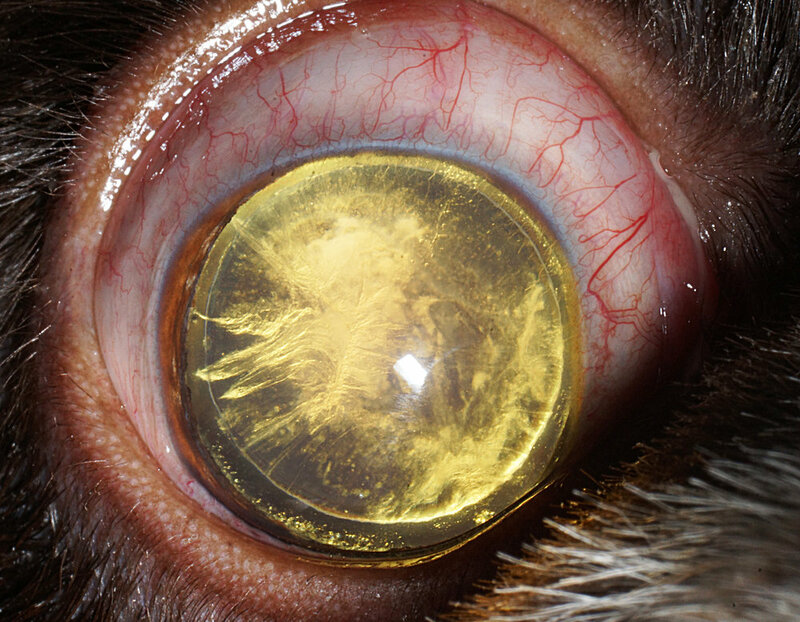 Poor nutrition is an uncommon cause of cataracts, but has been suspected in some young dogs. If you suspect a cataract. First arrange to have your pet examined by a board certified veterinary ophthalmologist. In the majority of cases, a patient with a cataract also has other underlying complicating ocular conditions. Early examination and full evaluation of the eye before the cataract is fully formed is always recommended. This allows full evaluation of the structures in the back of the eye, including the retina. Not all cataracts progress to full vision impairment. This question can only be answered by a board certified veterinary ophthalmologist who examines your pet, and many factors play into the cataract surgery decision process, including your pet’s general health and underlying risks for general anesthesia. In most cases, it is recommended that cataracts be addressed surgically early in their formation prior to full vision impairment. The various surgical procedures available for your pet are demanding and require meticulous and precise microsurgical techniques. Specialized operating microscopes and sophisticated microsurgical instruments make it possible for small incision intraocular surgery. Specific approaches and techniques based on your pets specific lens issues should be discussed with your veterinary ophthalmologist.